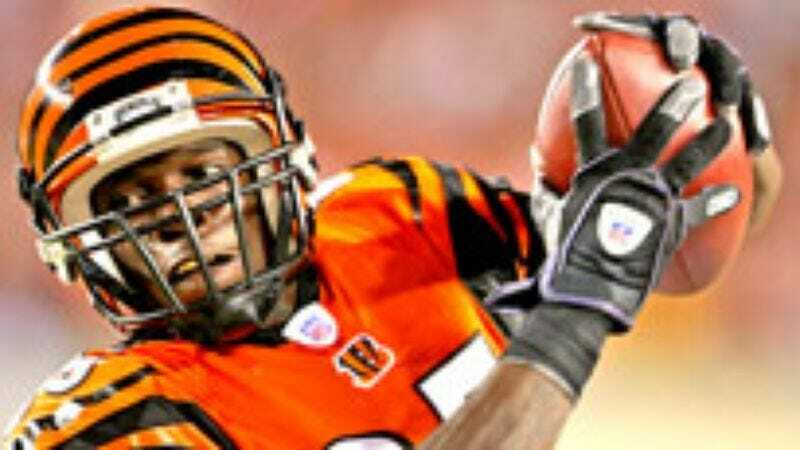 CINCINNATI, OH—The NFL Competition Committee levied a $35,000 fine against Bengals wide receiver Chad Johnson Thursday for an excessive reception in the fourth quarter of Sunday's game against the Titans. "After conclusively studying the film of Chad Johnson's leaping three-yard touchdown catch, we found that it was clearly a jab at the other team," said NFL Commissioner Roger Goodell, who felt the Pro-Bowl receiver's flagrant display of athletic ability was "gaudy" and "went beyond the bounds of good taste." "Did Johnson need to jump that high and stretch his arms that far out in order to catch the ball? I don't really think so… We need to warn him that if he pulls any more aerial stunts like this he will be suspended." Goodell added that he had reason believed Johnson's attention-grabbing end-zone antics were premeditated, and that such catches were rehearsed dozens of times during the week with the full cooperation of his team.